You may or may not remember the joy that came with our purchase of a General Master semi-automatic clothes washing machine a couple of years ago. Suffice it to say that the General Master has been a continuing, if not enduring, source of pleasure in our simplified lives. It provides just the right amount of connectedness with the mundane task of doing laundry and its’ semi-automatic convenience is a full-on luxury when contrasted with the washboard and tub, which implements are much better suited to forming a jug band than washing clothes, in my opinion. Anyway, a few days prior to the arrival of our recent and now departed guests, the General Master pulled up lame on the centrifugal spinner side. This effectively made it a semi-semi-automatic washer, rendering it incapable of generating quite as much joy as before. Of course, continuing to use the washing side of the machine was sill preferable to stripping the band of its musical instruments and resorting to raw-knuckle laundry scrubbing, but the General Master was no longer a source of abiding satisfaction here on our little hill. A cursory examination of its bowels revealed a bunch of powdery carbon-like material dusted across the bottom of the machine. Maybe the powder was residue from disintegrating brushes in the centrifuge-side motor, or perhaps the by-product of a failed capacitor? It was tough to tell without getting the parts to a bench. I began to dismantle the machine, quickly appreciating that there was apparently only one way to disassemble (and presumably re-assemble) the thing. In this regard the General Master exhibited a notably Chinese elegance and economy of construction that was increasingly compelling the deeper I looked into it. Of course I’m capable of the mechanical deconstruction and could probably manage an electrical diagnosis. I was even pretty sure I could track down replacement parts somehow. But–and this was a Satori-like revelation for me: I just didn’t feel like it. And so began our search for the Dominican equivalent of the Maytag repairman. In the interim our laundry took on a cadence of “Wash–Wring–Rinse–Wring-Hang,” and Repeat. The rhythm of the GM had been much nicer: “Wash–SPIN–Rinse–SPIN–Hang,” and Repeat. I could see right away that the “Wring” business was going to get pretty old, pretty quickly and began to imagine a solution. It was purely a matter of circumstantial coincidence that we recently took a 2 hour drive to Nagua to visit the Dominican equivalent of the Midas Muffler shop. This journey was necessitated by the need for a little muffler repair on exhaust system of the Jeepeta, where a weld had broken in the muffler resulting in a clattering idle that threatened to mutate into a full-throated roar more appropriate to a vehiculo de bomberos. I knew right where to find the muffler man and 20 minutes and 200 pesos later we idled out of the yard and were on our way. This guy was the best, even if his equipment was a little primitive. 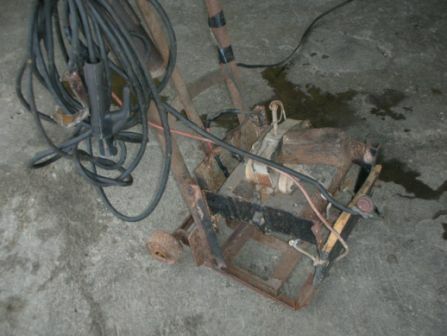 If you’re reading this on the El Otro WA website, here’s a snapshot of his arc welder, which actually works quite well. I didn’t ask permission to take a photo of him sporting his version of welding goggles, but you can be assured that he looked both competent and suave behind his Ray-Bans. The muffler project was so quick and painless–and the drive was so long that, after a brief visit to a relatively well-stocked grocery, we wandered systematically up and down the streets of Nagua in search of the lair of the Maytag Man. And damned if we didn’t find Sr. Ventura and his two associates, and damned if they weren’t relaxing just like that Maytag guy used to do in the US advertisements. The five of us had a pretty fulsome if somewhat abstract conversation about motors, capacitors, and sundry components of the General Master and, amid a fair amount of hilarity, we concluded that it would be best for us to deliver the machine to their shop in Nagua, even though the proprietor did volunteer one of his associates to journey to Las Galeras and make a repair en situ. And so with an exchange of names and clutching Sr. Ventura’s cellular telephone number, we bid a fond farewell, mounted our now-quieted carro and returned to Las Galeras comforted by the knowledge that our General Master was only a single day-long trip away from being restored to wholeness. When we got back to our barrio I shared with our immediate neighbors our discovery of and confidence in the Nagua-based repairman, and our consequent happiness. I’ll admit it: life can be pretty slow here at the end of the Samana peninsula and some days this sort of thing passes for big news. That was the case this time and there was a lively discussion of alternatives to Sr. Ventura and his well-stocked repair shop in Nagua. This conversation led, eventually, to Pegaro. Our friend Christian was the first to identify Pegaro as a guy who lives 20 minutes away on the road to St. Barbara de Samana and who could certainly repair the General Master and provide an enduring guarantee of his work. Supposing that it is generally better to patronize local craftsmen and not much relishing the prospect of a 4-hour round trip to Nagua, I arranged to follow Christian towards Samana the following day and discuss the repair with Pegaro. That’s how Denise found herself seated in a quiet Jeepeta by the side of the road, alone with a crippled General Master while I scrambled uphill on a narrow track and disappeared into the jungle. I imagine that she wished me luck as I vanished from sight. The path was pretty narrow; not entirely overgrown, but needing the attention of a machete. There were sporadic clearings on the narrowing path, each containing one or two houses in various states of construction and/or disintegration. As we advanced we periodically called out: Pegaro! Pegaro! I distinctly heard Christian mutter to himself that he was sure Pegaro should be living somewhere nearby. We encountered a few people who offered us quizzical looks, to which we responded with the one-word question: “Pegaro?” To a person they nodded in the uphill direction and so we plodded along. It felt odd, wandering in the woods looking for a washing machine repairman. I mean, there’s no sign of a bench, no evidence of a tool, and nothing remotely like the reassuring rows of replacement parts stocked by Sr. Ventura in Nagua. We were actually beating the bushes looking for the Maytag Man when, from behind a tree stepped one of the largest Dominicans I’ve ever seen. This guy had to be 6′ 5″ and must have weighed a solid 240. He was drenched in sweat and not smiling, his eyes inscrutable behind a pair of wrap-around shades. He wore saggy baggies over an improbable pair of plaid boxers and had, not one, but two artificial diamond stud earrings each the size of my thumbnail. He was right at home, but I suppose that I must have looked pretty strange to him. We studied each other for a moment before I asked hopefully “Pegaro?” whereupon he broke into a face-filling smile before responding “Ah, si, Pegaro!” and disappeared up an even smaller path to where Pegaro was working with the bananas in the hills. After ten minutes or so (during which another guy gave me three small plants when he noticed me admiring a particularly nice flowering bush) the big guy returned followed by a much smaller man who identified himself as Pegaro. He was compact, strong, and old. I had the sense that he had slipped into his worn high-topped and laceless leather shoes just for the trip down the hill to conduct this bit of repair business. I briefly described the problem with the General Master. Pegaro was nonplussed and non-committal although very interested in the work. Together we continued on down the hill to the waiting Jeepeta where we proceeded to contemplate the General Master by the side of the road. I noted with some interest that Denise didn’t appear to find anything unusual about any of this. In fact it seemed quite normal to me, too. After the requisite number of minutes of dirt-kicking, chin-scratching, and vague speculation we agreed that Pegaro would fix the machine at a reasonable price. He informed us that we could pick the GM up any day between 1:00 PM and 2:00 PM, which was the time when they generally had electricity. As I climbed into the car I watched Pegaro walk confidently up the hill into the jungle carrying our General Master on his head, shoes flapping loosely around his ankles. Pegaro is eighty-five years old. Two days later, we returned at 1:30 PM. Pegaro was waiting for us in a shell of a house next to the road. As I approached, he presented me with an obviously blown capacitor and the remains of some sort of hub/pivot that I was given to understand was the very heart and soul of the centrifugal spinner. With lots of animated gestures and some pretty interesting sound effects, he demonstrated the proper functioning of the parts and some of the possible ways in which they might malfunction. I repeated most of the effects, just to demonstrate that I understood. Again, Denise didn’t appear to see anything out of the ordinary in this behavior. I choose to believe this speaks well of her. Together, Pegaro and I peered at the innards of the machine and I could see where he’d spliced a second-hand capacitor into the wiring harness. At a glance, it appeared that the original capacitor was still in place, but I decided not to look too closely because I wasn’t inclined to discuss the actual origins of the blown capacitor in my hand. It was sufficient that the General Master had been returned to its full semi-automatic functionality, albeit in some ineluctable and Dominicanized way. Pegaro and I negotiated and agreed on a fair price, taking into account a modest gringo tax and the necessity of his traveling by gua-gua to Samana twice, first to find the parts and then back once more to pay for them once we concluded our end of the deal. So the machine is restored and, if anything, delivers even more pleasure than before. Wash–SPIN–Rinse–SPIN–Hang, Smile and repeat. I don’t know exactly how many hands were involved in conducting this transaction and effecting this repair but suspect it may really be upwards of a dozen, counting Christian, Denise, Pegaro and me. I’m also pretty sure that Pegaro’s fee was disbursed fairly broadly into the local economy and quickly. I’m also pretty sure that if we encounter a problem with the General Master in the short-to-mid-term that Pegaro will stand behind his repair. The US economy should function so well and the Maytag Men should but do likewise. Hope all’s well with you. Thank God we in the US finally have a national leader worth following.